A Newport Beach woman showcases exotic art in a private gallery. Noleen Kutash once hired a helicopter pilot to fly over a remote farm in the Natal region of South Africa. Her mission: to locate a Zulu artist. There was no telephone service in the area because the local tribes had been digging up underground wires for their crafts. Using a megaphone, the pilot called out Kutash’s phone number over the artist’s home. As an importer, the South African native understands that resorting to such extreme or unusual measures is part of the quest for exotic art. She takes the unconventional route as well in displaying her finds. Kutash showcases her collection, Phases Africa, in a private and personal space: her Newport Beach home. 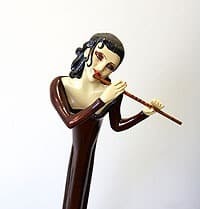 Among her favorite pieces are the painted carved colonial figures from Africa’s Ivory Coast, which stand 5 1/2 to 7 feet, and the 6-foot tall women with expressive faces carved from palm fronds from the Natal region. “I won’t buy it unless I see the spirit of Africa in it,” she says. The gallery-quality art pieces from Phases Africa are not among the safari souvenirs readily available to tourists, she says. To wit, Zimbabwean Shona stone sculpture, which is part of her collection, is also displayed among the permanent collections of the Rodin Museum in Paris, the Museum of Modern Art in New York and other museums throughout the world. Kutash started her company by showing at The Collection on Robertson Boulevard in Los Angeles in 2001. She moved to her Newport Beach home three years ago and began using her home to display her collection. Aside from the benefit of lowering the company’s overhead, her in-home showroom allows clients to see how well pieces can fit into a house. She mixes the best of Africa – both old and new pieces that reflect tribal and European colonial heritage – with the latest furnishings from South Africa’s contemporary designers. With a background in theater set and costume design, Kutash uses natural colors of the desert together with modern furniture to help bring the pieces to life. The two-story display offers a slant toward contemporary styling through accents such as the Medusa mirror and table carved from African obeche wood created by a Russian sculptor living in South Africa. African art mixes well with contemporary and traditional-style homes, she says. Contact the writer: jbush@ocregister.com or 714-796-5020. 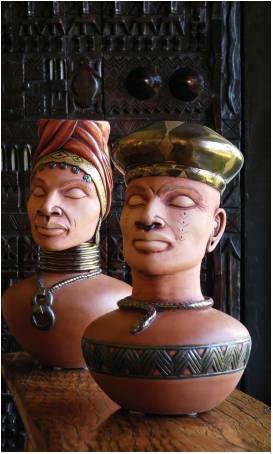 Sculptured ancestral clay pots of an African man and women stand 22-inch tall and are set against the background of an intricately carved wooden door. 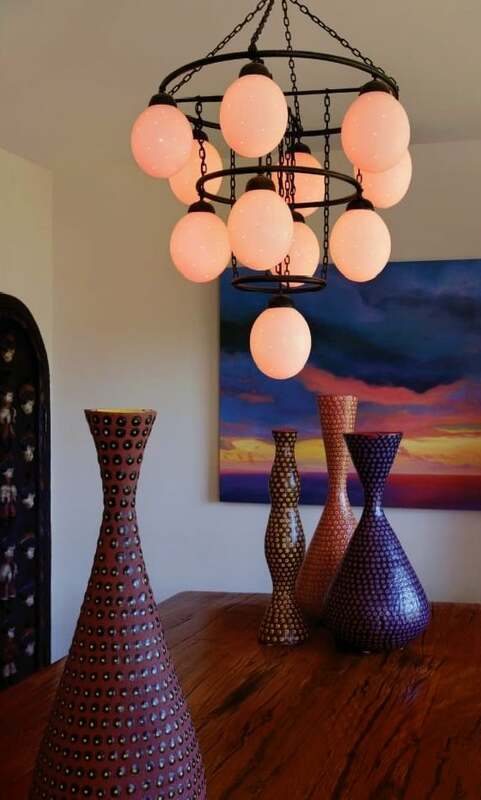 Colorful ceramic vases by artist B. Jackson rest on a yellow jarrah wood dining table below an ostrich egg chandelier. The jarrah wood was salvaged from old railroad ties.